When scooters were first invented, you had to propel them yourself with your foot. There was nothing to move you forward or to keep you balanced except your constant movement. Nowadays, with technological advancements, we’ve found an amazing motor-powered scooter called the Razor E200 Electric Scooter. The E200 has all kinds of unique features, but obviously, the fact that it’s motor-powered outshines almost all of them. This electric scooter is now a viable method of transportation to work, school, or wherever else you want to go around town. Some of us don’t like to be all sweaty and exhausted once you pull into work, so if that’s you, then these Razor scooters are definitely worth a second look. We scoured the internet for awesome inventions like these, so we’re obviously very excited to talk about it! We can’t start this article without first touching on the most important part about the scooter. Most people say that you should save the best for last, but sometimes the best electric scooter is just too good to hold off! If only these scooters were around when we were young, right? When you think about motor-powered scooters, you probably imagine some ripping, loud and obnoxious scooter flying down the street. Unlike your neighbor who always insists on riding his dirt bike every day, this motor scooter is intentionally ultra-quiet. Razor worked hard to ensure that you don’t disturb your surroundings while blasting around corners and down the street. The handlebars twist to fire up the engine, which quickly propels you along. 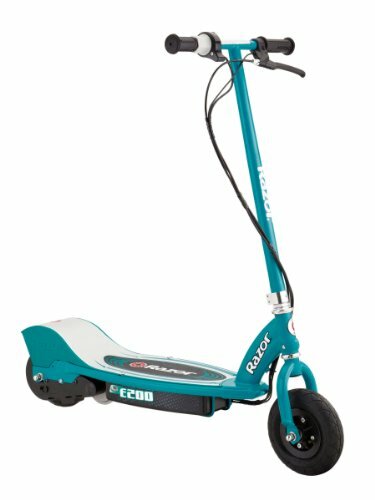 Don’t worry about pedaling your scooter anymore, because that’s a thing of the past with the E200. Simply twist the handlebar towards you and watch as you accelerate smoothly. Speaking of acceleration, you’re probably curious how fast this thing goes. At 12 MPH, you’re sure to not miss work with one of these. Lightly twisting the handlebars will give you a slower speed, which gives you complete control of the vehicle. We were skeptical at first, just as we’re sure you are. How long can a small 24v battery really last when it’s accelerating a scooter and a person down the street? Surprisingly, you can get up to 40 minutes of continuous riding out of one single battery charge! Most competitors only last 15-20 minutes, which is less than half of what you get out of the Razor E200. Another huge battery factor is the charge time. All you need for a full charge on one of these motor scooters is 12-24 hours. It might seem like a long charge time, but you’re not going to be using it at night. Simply plug it in when you’re done with it and it’ll be charged by morning! The recommended max charge time is 24 hours, which basically just means you shouldn’t overdo it. Another huge benefit to using a battery-powered vehicle instead of a gas-powered vehicle is the lack of pollution. As we all know, loads of gasoline being burned yearly is causing a serious problem in the environment. Using a battery-powered vehicle such as the E200 is a great way to make a better impact on the world! The tire on any vehicle or toy is a key feature. There are all kinds of factors that play a role in determining what the best tires for the situation are. These electric scooters use rubber tires, similar to the ones you find on cars. They help with a little more rugged terrain and fuel efficiency, as well as wear damage. Many hard plastic tires can wear down over time, which renders them useless eventually. However, when these tires begin to deflate you can simply pump them back up and hit the road again. Spare tires are sold separately, which is another difficult thing to find when it comes to plastic tires. The rubber tires also provide a smoother ride. Hard plastic tires using end up feeling bumpy and don’t suppress the rocks on the road. Small pebbles cause an uncomfortable ride at times unless you use rubber tires of course. When a car drives over gravel, you barely feel it. But when you drive over gravel on a regular scooter, you get stopped in your place! The same principle applies with the rubber tires on this motor scooter. + Fuel-efficient, quiet motor that propels you to your next destination. No more constant pedaling to get to work, you shouldn’t be exhausted right when you arrive! + Rubber tires for better gas mileage and rugged terrain driving. 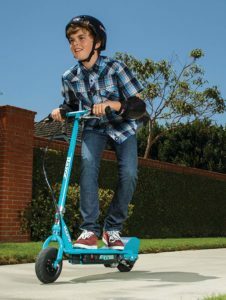 Although these scooters aren’t off-road vehicles, they can be used to get over a patch of grass or dirt, unlike most other scooters. + Small 24v battery that packs a huge punch in a small battery. 40 minutes of continuous running time at only a night’s worth of charging is exactly what you need to get to and from your destination. It’s also a much better solution to stay eco-friendly instead of burning gasoline! + Easy to access handgrips that twist to accelerate you down the street. You don’t have to worry about buttons, foot pedals, or extra levers to propel these motor scooters. + Some people might not like the 12-24 hour charge time since it might be inconvenient. That being said, simply charge it near the end of the day and it’ll be ready by the morning. + Only one color, blue, is featured. However, blue is a neutral color that works for most people. We’re sure the rest of the features will make up for the lack of color options! These motor-powered scooters are perfect for anyone who enjoys the outdoors. They’re a perfect way to take a relaxing cruise down to work or school without working up a sweat and showing up tired before you even start. Instead of causing pollution with a car, you can use one of these battery-powered scooters to stay environmentally-friendly while still being quick and efficient. Although the idea of riding a regular scooter to and from work might sound nice, it can wear you out and cause cramps after a while. Nobody wants to feel like they just had leg day when they’re about to start working an 8-hour shift! Not to mention you might look a little bit drained too. So who is the Razor E200 suitable for? Pretty much anyone! Who doesn’t like the idea of cruising around on a motor scooter? You’ll love it, and your friends and family will want one too! Just make sure they all wear helmets when operating them since they are motor-powered and accelerate quickly. Safety is of high importance to Razor, as always. They installed a quick-access brake on the left handlebar so you’ll always be able to slow or stop when necessary. Many other brands have foot brakes, which isn’t always convenient when you’re flying down the street at higher speeds. Instead of searching around for a pedal, you can keep your eyes on the road or sidewalk and quickly grip the brake on the handlebar. The moment we laid eyes on the E200, we knew it would be something that everyone should know about. While it’s very efficient in taking you to and from your destination, it’s also just a really cool invention! Again, don’t you wish these were around long ago? So many people are using cars to get to work because it’s much quicker. You get there 5 to 10 times faster than walking, and you can enjoy the comfort of being inside a vehicle. The problem with cars is that they put off so much pollution into the air that we’re ruining the environment. Luckily, battery-powered cars, scooters, and bikes are all becoming much more accessible and reliable. Driving a battery-powered scooter to and from your workplace or school is a great way to take a little bit of the pollution out of the air. Even if you’re not using it for every outing, it’s still a great way to make a dent in an ever-growing problem! We loved the 24v battery in this motorized scooter because it’s quiet but super healthy for the environment. At a small charge time, you don’t have to go days between uses. It can literally be a regular, daily used vehicle at a fraction of the price of most cars or motorcycles!